Click here to see a JPEG of this microbe. Image Courtesy of: Yokoyama, Mel; Cobos, Mario A. This protist lives inside the rumen of cows. The hairy stuff on the outside of it is "cilia." Cilia is Latin for eyelash. 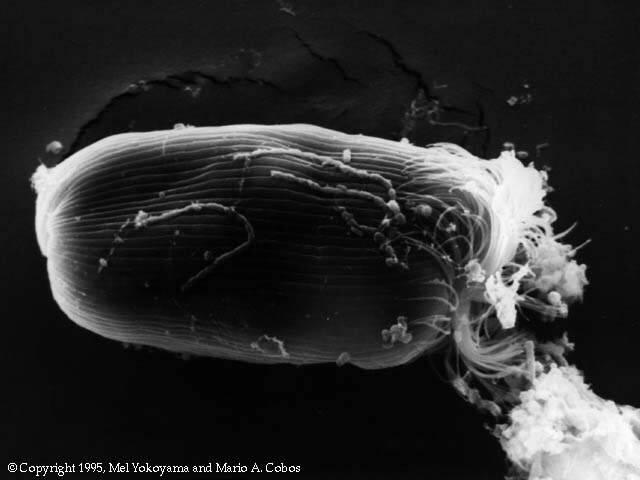 These cilia wave back and forth and either propels the microbe through the water, or they propel food toward it. This protist has several chains of bacteria that are stuck to it. Protists that are covered with cilia are members of a group of protists called Ciliophora. This means eyelash bearer.